Journey to the 16th century to discover the fiery passion of Saint Teresa of Avila, one of Christianity's most inspiring saints. A tireless reformer and the mentor of Saint John of the Cross, Teresa's greatest legacy is her revelation of ecstatic love for God -- a love so powerful that it pierces the heart like a burning sword. 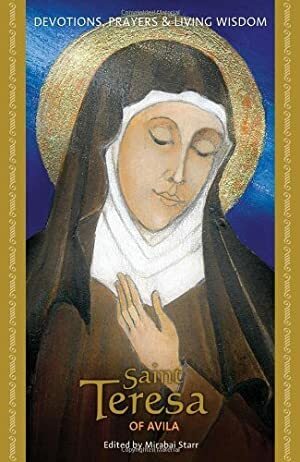 Through illness, hardship, and persecution by the Inquisition, this courageous mystic lit the way with her unquenchable spirit to an "interior castle," a place of unimaginable beauty and light where no darkness can touch us. Saint Teresa of Avila gives you a direct link to the living presence of this brave and gentle woman, to draw upon her strength in your own times of need. Log In to track Mirabai Starr on eReaderIQ. to be notified each time the price drops on any book by Mirabai Starr. to stop tracking Mirabai Starr. We started tracking this book on October 15, 2011. The price of this book has changed 51 times in the past 2,747 days. The current price of this book is $8.29 last checked 8 hours ago. The lowest price to date was $7.96 last reached on January 4, 2012. This book has been $7.96 2 times since we started tracking it. The highest price to date was $12.95 last reached on January 28, 2019. This book has been $12.95 12 times since we started tracking it. We last verified the price of this book about 8 hours ago. At that time, the price was $8.29. This price is subject to change. The price displayed on the Amazon.com website at the time of purchase is the price you will pay for this book. Please confirm the price before making any purchases.